I close out my Month of New Acquisitions with a pioneer American modernist. Pioneer because she was exploring avant-garde art at a time in America that it was not popular. Between the time of the first Armory Show in New York (1913)—which introduced Americans to European avant-garde art such as Cubism, Post-Impressionism, and Expressionism—and the onset of the Great Depression (1929), some American artists eagerly pursued modernist approaches in art. The economic collapse of the Great Depression caused art patronage for modernism to virtually dry up, and Americans to look inwardly. Americans wanted to see art that portrayed the glories of American life in a realistic way. A few artists persevered in pursuing all forms of avant-garde exploration, and many of those artists were women. Helen Lundeberg was a cofounder of one of the few independent avant-garde art movements in America in the 1930s: California Post-Surrealism. Surrealism was a European movement that stressed expression of subconscious impulse rather than rational thought. The irrational was preferred over the logical. Lundeberg, born in Chicago, studied at the Stickney Memorial School of Art in Pasadena, California. Her mentor, and later husband, was Lorser Feitelson (1898–1978), an early modernist who had studied in Europe under Italian surrealist Giorgio de Chirico (1888–1978). De Chirico’s work was characterized by classical elements set in dream-like landscapes. Lundeberg and Feitelson became an influential couple in forward looking art in Southern California. Lundeberg’s art took surrealism a step further than pure psychic automatism (stream of consciousness). Beginning in the early 1930s, she began trying to reconcile subjective, introspective imagery with the rational, conscious mind. Lundeberg wrote a theoretical manifesto [New Classicism (1934), her term for Post-Surrealism] to accompany their first Post-Surrealism exhibition (1933). 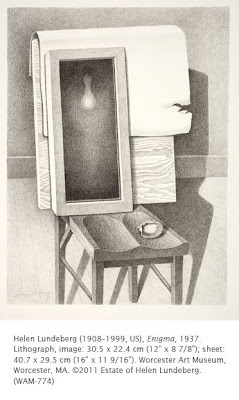 “Enigma” was one of a series of four lithographs Lundeberg produced for the Federal Arts Projects (a Federal program to help unemployed artists) print division. The lithographs pursued the same themes as her paintings, exploring images from memory and imagination. The post-surrealist artists differed from their surrealist counterparts in Europe in that their compositions often included a more-or-less rational space, but with scale and object incongruities. This seeming still life features—depending on what a viewer decides—a mirror reflection a hanging light bulb from no logical place in the composition, or a box with hanging light bulb within. A couple other pioneering avant-garde women artists from the same period are Gertrude Greene and Irene Rice Pereira. Have never heard of Helen Lundeberg before - her lithographs look amazing and would look wonderful in an exhibition with Max Ernst.Thank you very much for the introduction to her work.